In the same way some bloggers and webmasters are using Black Hat SEO techniques which do increase their traffic in quick succession but they are not aware of the fact that if they got caught this would destroy their blogging career. According to Google “Black hat tactics are unprincipled over violent marketing efforts where an organization tries to manipulate search engine results in an unjustified way”. Do you still believe that receiving fame is one day game absolutely no it is the men’s dedication which makes him stand out performer. For the time being Black Hat SEO would surly increase you traffic but in future it will lead you to get banned by Google. 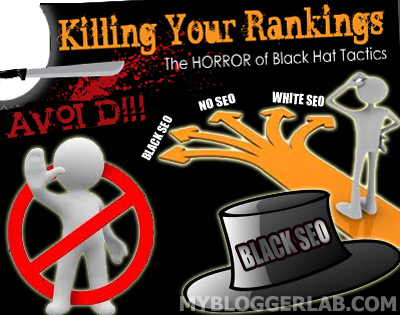 So today we will disclose The Top 10 Black Hat SEO Techniques That Kills a Blogger. In the language of Search engine optimization, the term Black Hat SEO stand as the aggressive technique or tactic which is adopted to influence Search engine not humans and usually they are not obeying the rules of search engines. Black Hat SEO is more often used by those bloggers who are looking for a quick financial return to their blog or website. Using Black Hat SEO posse’s greatest risk as it could result in getting you banned from a search engine. It may also refer to an unprincipled or spammed way of getting your page ranked high in SERP. Doorway pages are those certain web pages which are created for the intent of being crawled by a spider and get included in Search engine results (SERP). They usually optimized those pages with over stuffed keywords. You often see those websites which are targeting primary pages with the same chunk of keywords. Some Doorway pages use different strategy they use a redirecting system which redirect users from one page to another unrelated page. All these Pages are more commonly known as Spamdexing pages. This technique is most commonly used by bloggers where they select a bunch of keywords for which they want to get ranked high in SERP and they place keywords on the pages in such away that are only readable by Bots, not for human beings. They usually use a hide text with DIV tag where they stuff all these keywords, by blending text with same background color, hiding text behind images so that only crawlers can see them. Content scarping is its close relative, snipping are among those Black Hat Seo techniques which uses software to manipulate the original content. This software grabs a chunk of content and regenerates the same content with different style. Usually these pages contain link to those sites which the author is promoting. This technique is pretty much similar to Doorway page tactic. The main idea behind chocking a web page is to show a doorway page to search engine crawlers but the “Money page” (Where ads are place) to human visitors. Both pages can access with the same URL. Software identifies the crawlers and redirect them to doorway pages and when it discovers the visitors it send them to “Money Page”. This is the most used tactic, link spamming is the easiest way to get you site link to those websites which are related to your niche. The whole process is work on automation by the help of software which use different proxy and leave a link in comments. So it’s getting necessary for every blogger to use comment filter to fight against spammed comments. Keyword stuffing is the cousin of Hidden text. Keyword stuffing is considered as the most worst method of getting high ranked in SERP. Keyword stuffing occurs when a web page is over loaded with numberless keywords. But Keywords stuffing is the story of paste now search engines are so advanced hence this has low value in ranking today. Avoid Buying Links: When a person pays a guy to get a backlink he usually inserts an unknown link between his posts which has no importance for the audience hence crawlers identify these links are paid. Avoid Cyber Faking: It means to create fake stories which never existed. Create a fake story on a popular artist and then spread it all over the social networking websites like Youtube, Facebook. Avoid Modifying Content – Duplicating: Copying content from a blog and then posting it to your website by doing few optimization. It is one of the most worst Black Hat SEO which should be avoided. Avoid Fake Traffic From Bots: This tactics is based on robotic traffic which usually consists of same IPs it should be avoided other wise your site could be banned. So it’s the moment of truth that we should elaborate our way of thinking, get our self out of the shell and think more than our expectation. Black Hat SEO is one of the worst thing of this universe, as we have heard from our ancestors “you will always get two ways in your life one way will lead you to success while other way will lead you to destruction”. In the same way Black Hat SEO is another name of destruction. So we should never waste our time in such uneventful activates, instead we should create unique content and interact with our audience to know what they desire. So That's it guys till then Peace, blessing and Happy Avoiding Black Hat SEO . Credits:Images courtesy of SEO.com. Hmmm i will stay away from all of these ! Very good post faizan.. I like this post and very informative. Thanks Pal, Readers like you does give a Boost To Authors Peace. Thanks for all the information. It is a big help to us. Thanks For Liking All our Efforts. And I Admire your Believe Thats the Spirit. Peace Buddy. I think your blog is truly awesome, fantastic and all of those fancy words. I’ve subscribed to your RSS-feed, and everytime you update your blog – I read the latest post ... no matter where I am. It could be on my mobile or on my computer. It doesn’t matter. Your blog simply owns. I will therefore link to it from one of my tech blogs if that’s okay with you. I've always been avoiding this things. I don't want any web spiders just let downfall me because of my silly Black Hated SEO techniques..